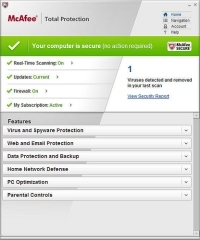 The thing about antivirus companies is that we, the user, are trusting them to protect our computers. They’re supposed to keep the bad guys from being able to do damage to our computer and its pertinent information. Unfortunately for users of McAfee Antivirus 8.7, the only thing attacking your computers is McAfee itself. That’s right, in the company’s most recent software definition roll-out, the McAfee company’s signature antivirus system turned on an otherwise uninfected Windows system file, deleting it and basically ruining your computer. This is quite possibly the biggest quality control failure I’ve ever seen, but given that we’re talking about McAfee, you can expect nothing less. The glitch affected McAfee’s huge corporate installation base, knocking out computers for entire county governments, IT firms, and generally everywhere that depends on McAfee for corporate security (including where I work). McAfee has released a solution to the problem, but… if there’s any reasonable justice in the world, this will finish off McAfee as a company. They put out the absolute worst antivirus program I’ve ever seen. Seriously, I’ve begged and begged to have it taken out at work, only to be rebuffed by our IT department managers. Even some of them don’t like it, but they keep using it because… I’m not sure why. It’s probably cheap, but Windows Defender is free and it works much better than McAfee ever has.